A narrow endemic native to the Madonie Mountains of Sicily where the entire population consists of only 30 individuals. Forms a broad, conical tree between 15–18m tall. Branches spreading horizontally. Bark smooth in young trees but exfoliating in small plates with age, exposed bark brown, later grey. Leaves 1–2 x 2–3.5cm, spirally arranged, the upper leaves covering the shoot and directed forward, the lower parted with two greenish white stomatal bands beneath. Vegetative buds conical, slightly resinous. Female cones 10–18 cm, cylindrical, maturing from green or reddish-brown to brown; bracts exserted, reflexed, triangular and long pointed. Male cones lateral, crowded, 1.5-2 cm long, greenish yellow with purple microsporophylls. The Sicilian or Nebrodi fir is endemic to the north–central part of Sicily. It once had a much broader distribution across the Nebrodi Mountains after which it was named but today it is limited to slopes above Polizzi Generosa in the valley of Madonna degli on Mt. Scalone. (Knees 2011). 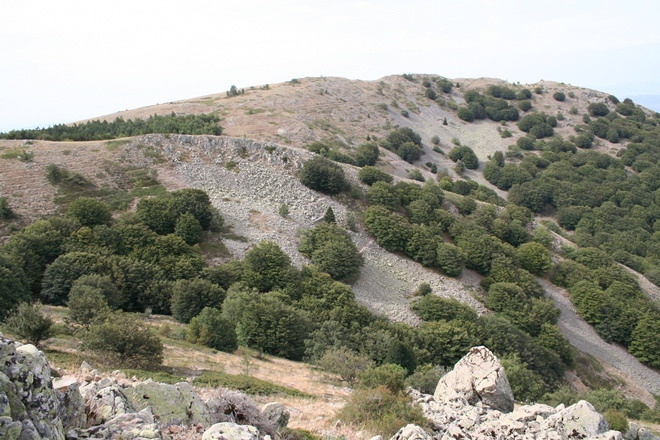 This species is scattered across a north west–facing cirque on steep limestone slopes with Crataegus monogyna, Daphne laureola, Fagus sylvatica (stunted), Ilex aquifolium and Prunus spinosa. The forest was formerly dominated by Abies nebrodensis and Fagus sylvatica (Knees 2011). This species is too rare to be exploited. Historically the timber was used for construction. There are about 30 mature trees in the current population and although some saplings are now established in the vicinity of these trees, it is premamture to suggest any change to the current conservation status. This very small population size meets the criteria for listing as Critically Endangered under Criterion D.
The principal threats facing this species are fire and the small population size. The few remaining trees are vulnerable due to a severely degraded habitat as a result of historic logging and localised erosion, indeed these factors have probably had a detrimental effect on local hydrology thus making the future establishment of young trees very difficult. 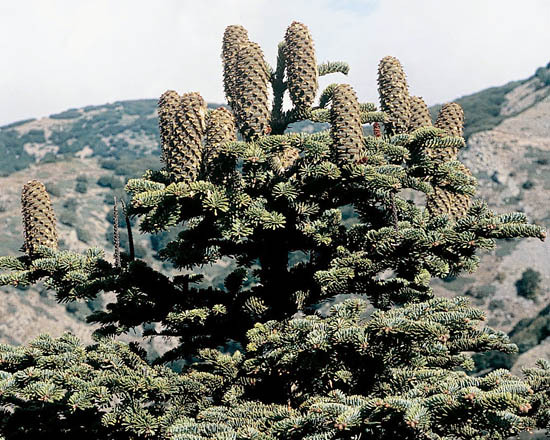 The poor health of specimens propagated in local tree nurseries, and threat from hybridization with nearby plantations of Abies cephalonica and climate change do not bode well for this species. (Knees 2011). This species is included in Appendix I of the Bern Convention and as a priority species in Annexes II and IV of the Habitats Directive. The woodland vegetation in which this species is found is listed in Annex I of the same Directive. An EU LIFE funded project was carried out from 2001–2005 (Silva et al. 2008). The immediate aim of the project was to stabilize the existing population and improve the survival rate of natural seedlings and planted trees raised as part of an ex-situ programme. Wider aims included the elimination of non-indigenous fir species and the restoration of the natural ecosystem. All work has been carried out within the boundaries of the Madonie Regional Park. The number of mature trees has increased from 29 to 30, while natural seedlings have increased from 30 to 80. An extensive ex-situ programme has been in place for a number of years with trees planted in the Botanical Garden of Palermo (Italy) as well as in summer villas and second homes in the Madonie Mountains, slightly apart from their natural area of distribution. They have also been distributed to other botanic gardens and arboreta in Europe. One of the most comprehensive collections is at Dawyck Botanic Garden where there are trees from 15 different genotypes. A programme of controlled pollination instigated as part of the EU LIFE funded project has resulted in the production of an additional 3,000 plants for re-enforcing the existing population (Silva et al. 2008). Conte, L., Cotti,C., Schicchi, R., Raimondo,F. M. & G. Cristofolini. (2004). 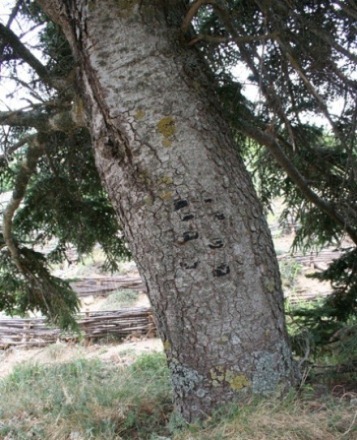 Detection of ephemeral genetic sub-structure in the narrow endemic Abies nebrodensis (Lojac.) Mattei (Pinaceae) using RAPD markers. Plant Biosystems. 138(3) 279-289. Ducci, F., Proietti, R. & J.–M. Favre. (1999). 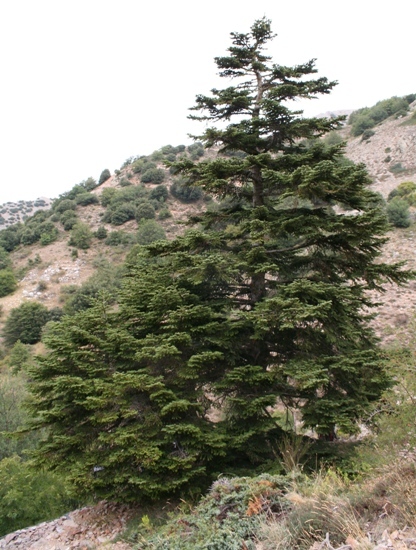 Allozyme assessment of genetic diversity within the relic Sicilian fir Abies nebrodensis (Lojac.). Mattei. Ann. For. Sci. 56: 345-355. Farjon, A. and Page, C.N. (compilers) (1999). Conifers. Status Survey and Conservation Action Plan. IUCN/SSC Conifer Specialist Group. IUCN, Gland, Switzerland and Cambridge, UK. Knees, S.G. (2011). Phylogeny, Systematics and Conservation of Abies, especially those around the Mediterranean Basin. Reading. Unpublished PhD Thesis, University of Reading. Morandini, R., Ducci, F., & G. Menguzzat. (1994). Abies nebrodensis (Lojac.) Mattei. Inventario 1992. Ann. Ist. Sper: Selv. 22:5-5 1. Parducci, L., Szmidt, A.E, Ribeiro, M.N. & A. D.Drouzas. (2001). 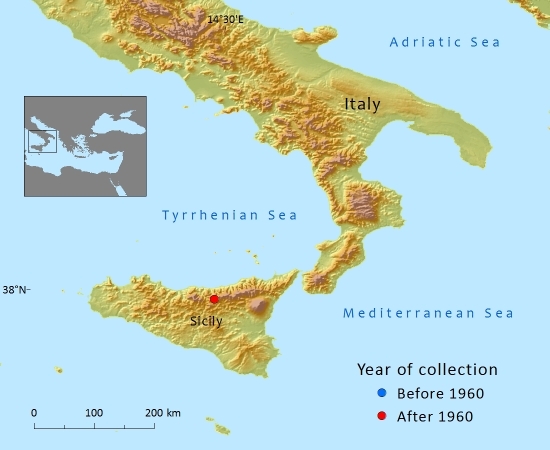 Taxonomic position and origin of the endemic Sicilian Fir Abies nebrodensis (Lojac.) Mattei based on allozyme analysis. Forest Genetics 8(2) 119-127. Raimondof, M., Venturella, G., & di Gangif. (1990). Variazioni fenotipiche in Abies nebrodensis (Lojac.) Mattei e comportamento vegetativo nella sua discendenza. Quaderni di Botanica Ambientale Applicatu. 1:183-2 10. Silva, J. P., Toland, J., Jones, W., Eldridge, J., Thorpe, E., Campbell, M. & E. O’Hara. (2008). LIFE and Europe’s endangered Abies nebrodensis. Sottano, P. (2004). Conservazione di Abies nebrodensis e ripristino torbiere di Geraci Siculo. Parco delle Madonie. Thomas, P. 2011. Abies nebrodensis. In: IUCN 2012. IUCN Red List of Threatened Species. Version 2012.2. . Downloaded on 07 March 2013. Vendramin, G.G., Michelozzi, M., Tognetti, R., F. Vicario. (1997). Abies nebrodensis (Lojac.) Mattei, a relevant example of a relic and highly endangered species. Bocconea 7: 383-388. Schicchi, R.,Knees, S.G.,and Gardner, M.F., 2016. Abies nebrodensis, from the website, Threatened Conifers of The World (http://threatenedconifers.rbge.org.uk/taxa/details/78).